Thursday August 13, 1942 Dear Folks, It is now six thirty in the evening, and I have just returned from town, today being my day off. Had the most enjoyable time of any liberty since coming to Miami. However, to tell you the story properly I must begin a few days back. Two or three weeks ago I had a letter from Barbara Miller saying that Jack Riley was now stationed in Miami with the FBI, and that his wife was going to join him soon. This was all quite interesting news to me for Jack was in law school at the same time I was and his wife is the former Mary McHugh, a Delta Gamma at Iowa, with whom I enjoyed many good times. I managed to get their telephone number and culled them up, out of which came an invitation to dinner for last night. They are staying in an apartment out on the Beach not far from the hotel where I put up nearly everytime I have liberty. When I arrived shortly after seven oclock there was Mary, as pretty and appealing as ever, but with the disappointing news that Jack had been called to Tampa and wouldn't be back for a few days. However, in order not to put me in a "compromising" situation, as she so cleverly phrased it, she had asked a mutual friend to have dinner with us. He turned out to be Jim Dower from Marengo, Ia. who, also, was in law school at the same time I was; in fact he roomed right across the hall. We had a wonderful time talking over old times, catching up on the gossip, and in general thoroughly enjoying an all Iowa company. Mary humbly apologized before serving that she had had no experience with cooking before getting married, but I am here to testify that she has come along away in a short while. We had meat loaf, baked potatoes, sweet corn, rolls, a good salad, cantaloupe, brownies, and a couple of glasses of milk. Everything was simply but excellently prepared. My appetite has been restored once again. Our long and interesting confab after supper disclosed among other things that about half of the Iowa law school, as I knew it, is now in the FBI. I, also, learned that Jens Norgaard, whom you will remember as an end at Iowa, is now stationed over at Ft. Myers as an army bomber pilot. Many and varied were the experiences and stories we exchanged none of which would hold much interest for you folks, but suffice it to say that I had a marvelous time and shall plan to drop out and see them again. I checked in at the Patrician where Marvin had already taken a room for the both of us about 11:30. We both sleptquite late this morning as we always do, then while he wrote some letters I read my lesson. After a brief swim we checked out, got a bite to eat, and then went to see Mrs. Minniver, one of the finest shows I have ever seen. I just can't tell you how fine I think it is. I suppose you have already seen it, but if not don't fail to make the effort, it is superb and lives up to all that has been said of it. 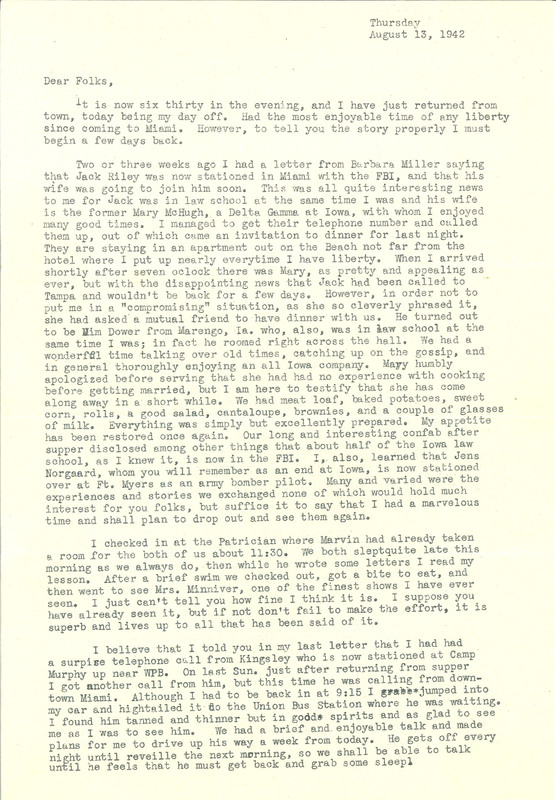 I believe that I told you in my last letter that I had had a surpise telephone call from Kingsley who is now stationed at Camp Murphy up near WPB. On last Sun. just after returning from supper I got another call from him, but this time he was calling from downtown Miami. Although I had to be back in at 9:15 I jumped into my car and hightailed it to the Union Bus Station where he was waiting. I found him tanned and thinner but in good spirits and as glad to see me as I was to see him. We had a brief and enjoyable talk and made plans for me to drive up his way a week from today. He gets off every night until reveille the next morning, so we shall be able to talk until he feels that he must get back and grab some sleep.